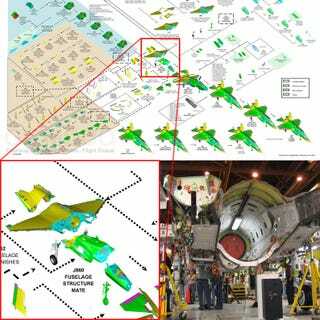 Click to view If you want to have your own F-35 Lightning II fighter jet, look no further because Stephen Trimble-from the always-good The Dew Line-has sent us high resolution instructions showing Lockheed Martin's construction process. Piece by piece, the instructions look straight from the Pentagon's Lego set. Grab yours after the jump, along with the shopping list with all the materials you need and actual images of some of the steps. 29,036 pounds of composite, aluminum, titanium, and miscellaneous alloys for the fuselage. 1 × Pratt & Whitney F135 afterburning turbofan. 1 × Rolls-Royce Lift System (for STOVL model). 1 × Multi-Mission Active Electronically Scanned Array (AESA) Radar. 1 × Electro-Optical Distributed Aperture System, for full 360º situational awareness. 1 × Electro-Optical Targeting System + 1 × Sapphire Window. 1 × Helmet Mounted Display from hell. 1 × GAU-22/A 25 mm cannon. 1 × 8" x 20" Multi-Function (panoramic projection) Display System (image below).